They’re not mad at President Obama for failing to make freeing American hostages held by Iran an issue in negotiations with that nation. 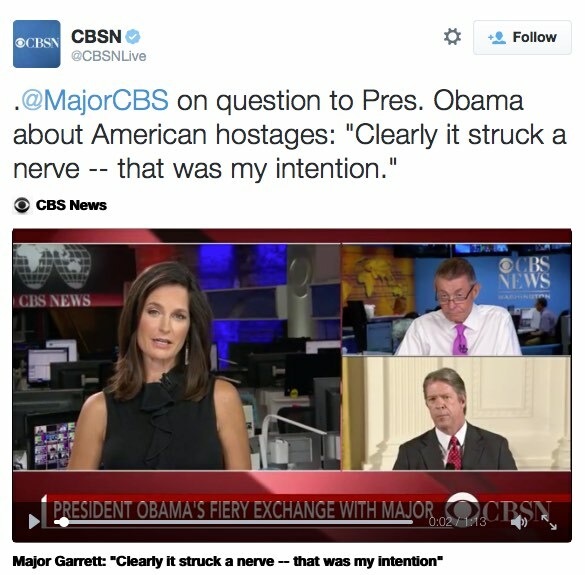 Instead, they’re furious at Major Garrett of CBS News for daring to ask Dear Leader a question about it, even though in the process Garrett got a clearly irritated Obama to make news by admitting, and then trying to justify, his team’s failure to make such an effort. Q. Thank you, Mr. President. As you well know, there are four Americans in Iran — three held on trumped-up charges, according to your administration; one, whereabouts unknown. Can you tell the country, sir, why you are content, with all the fanfare around this deal, to leave the conscience of this nation and the strength of this nation unaccounted for in relation to these four Americans? THE PRESIDENT: I got to give you credit, Major, for how you craft those questions. First – The notion that I am content as I celebrate with American citizens languishing in Iranian jails (5-second pause while Obama composes himsself. — Ed.) — Major, that’s nonsense, and you should know better. If “nobody is content,” then why are “international negotiators celebrating a deal with Iran”? If Obama isn’t content, why is he clearly satisfied with himself for having a “deal” with a country which is still holding American citizens hostage? The President’s attempted explanation is hogwash. As long as Iran holds hostages, it has leverage. It still has hostages, so it still has leverage. President Obama has now admitted that they didn’t even try to bring up the hostages during the negotiations. Because of that, we now know, willingly or not, that anyone who has told the hostages’ families and other loved ones that they were “doing everything we can” to free them has been lying. … As a result of this deal, Iran stands to reap a potential windfall of billions of dollars that has been held up by international sanctions designed to cripple the Iranian economy and bring Tehran to the negotiating table. The people who believe in “Death to America!” will have more resources to try to achieve it. It is wholly unrealistic to expect intelligence efforts to track all of this. It would have been far better to prevent it from arising. The deal clearly does not prevent that. DANA BASH: I just wanted to add, you’ve been a White House reporter. I’ve been a White House reporter. You know what it’s like to stand up and ask the president a question. Garrett’s questioning during this and other interviews around that time in 2008 relating to the Rev. Jeremiah Wright controversy was surgical, and their results should have been damning. That they weren’t says a lot more about Garrett’s journalistic peers, whose obsession at the time was pretending that Wright was irrelevant, than it does about him.